By Caz | October 19, 2018 | This post may contain affiliate links, which means we may receive a small commission, at no cost to you, if you make a purchase through a link. Read our Disclosure. 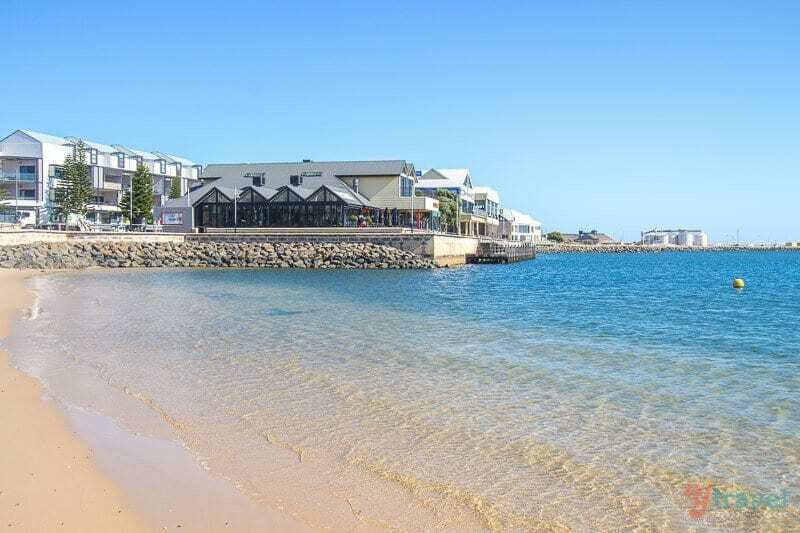 We visited Bunbury on Australia’s west coast because our lovely friend Jo Castro had told us about her coastal home. 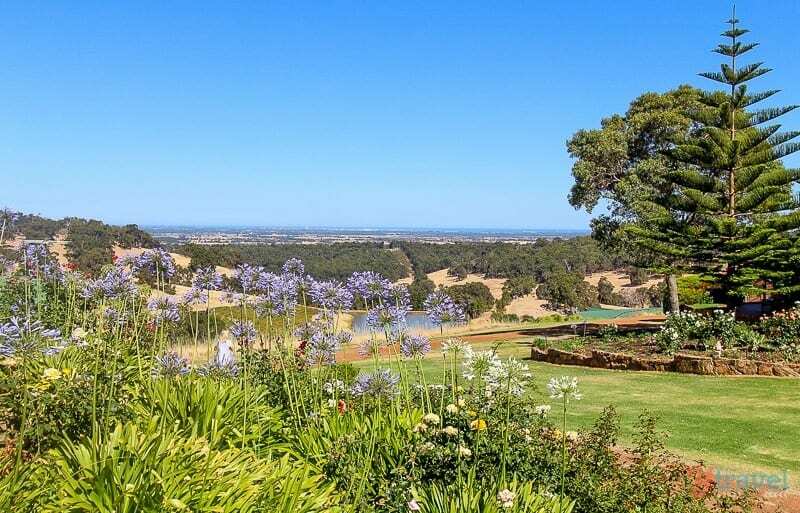 It’s only two hours south of Perth and 40 minutes north of Margaret River. Quieter than both, it offers a relaxing getaway with a surprising number of things to do there. 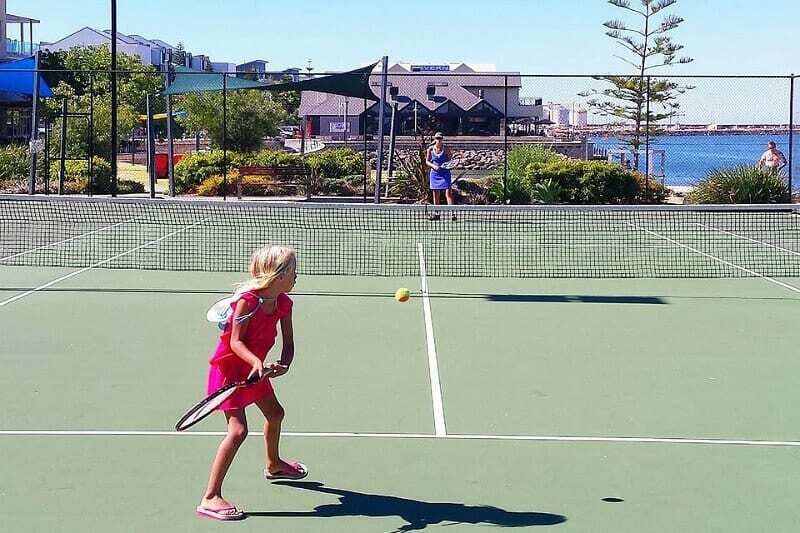 Lucky for us, Jo was in town when we were and she took us out for the day to share with us some of her favourite things to do in Bunbury! It’s always great to see an area with a local and spend the day with her. She’s a beautiful lady and the girls adore her and her husband Dave, who we had the pleasure of spending the evening with at their house chatting all things travel. Jo’s lived a travel lifestyle since she slung a guitar over her shoulder when she was 18 and embraced the roving lifestyle. Dave and her have since raised their children as expats in many different countries. When I stress about the negatives of long-term travel with kids I turn to Jo for inspiration and encouragement that is actually a gift despite some of the negatives. 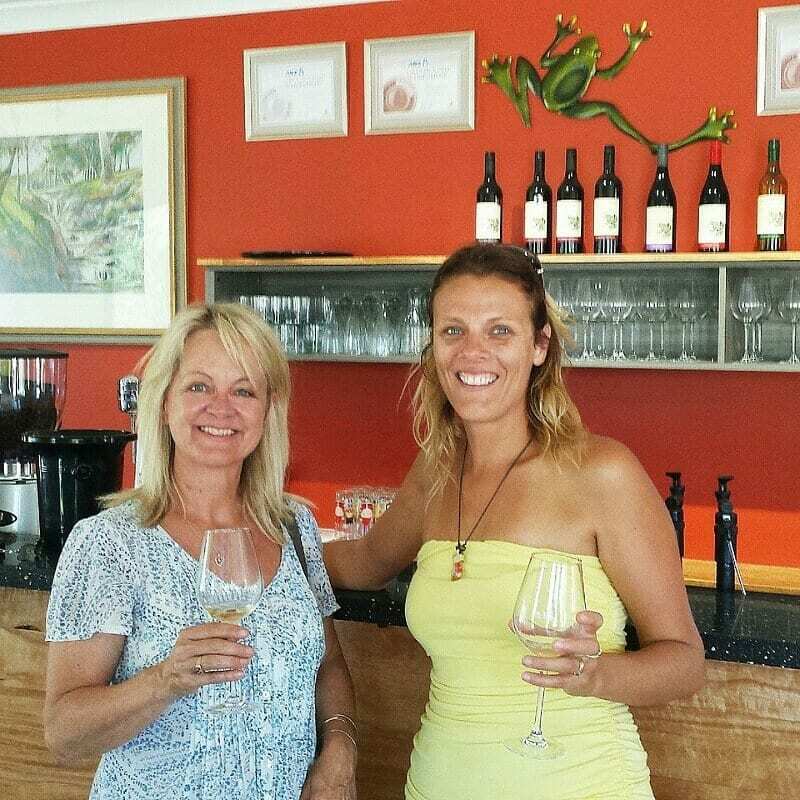 Jo took us outside of Bunbury to the Ferguson Valley, a growing wine and food region. 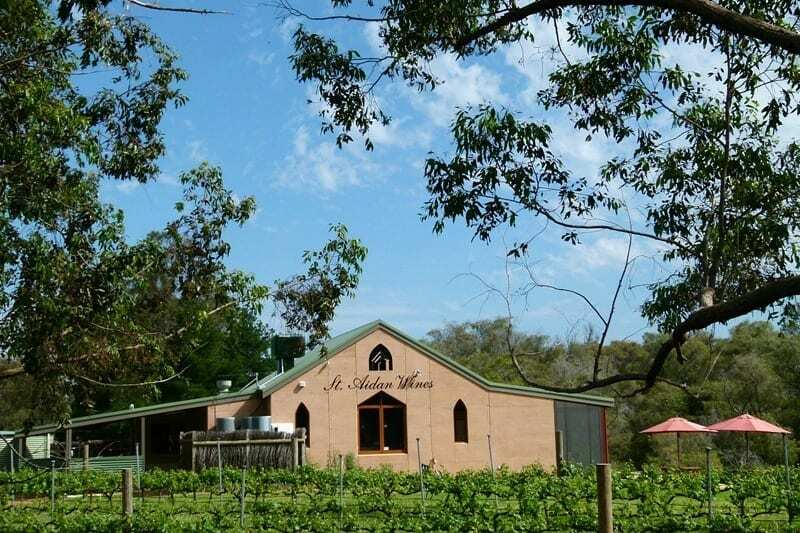 Definitely lesser known than Margaret River, but worth exploring for its humbleness and home-grown flavour. It was quite dry when we visited, but in the rainier months this area turns into a green lushness to rival Ireland. Rolling hills with views stretching out to the coast of Bunbury on a clear day. Our first stop was picturesque Ferguson Farmstay, a function centre for a lot of weddings and boutique accommodation. 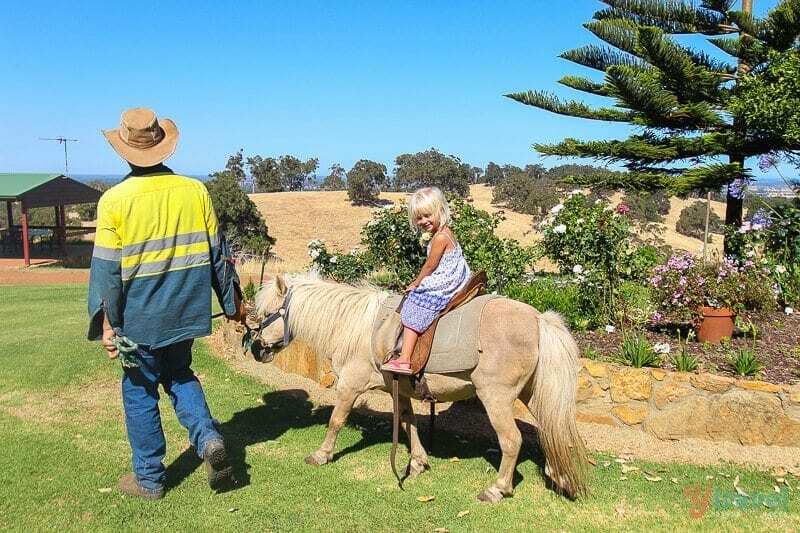 It’s a 45-hectare property sitting on top of the hill taking advantage of the views across the valley all the way to Bunbury and the coast. 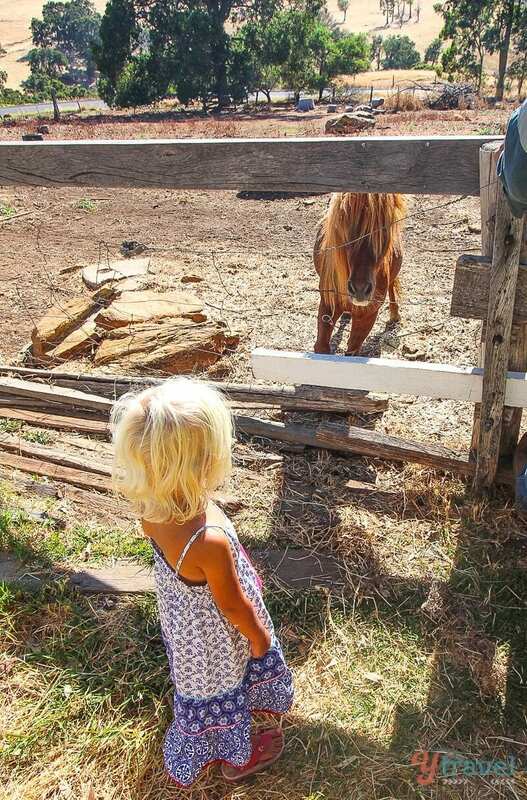 Kalyra and Savannah got to hang out with some farm animals – always a treat for the kids. They fed the goats and pigs, kangaroos, and chickens. And then had a pony ride. It was Savannah’s first one and she jumped off asking if we could buy her a pony! Down into the rain-forested valley are beautiful cottages to rent at Peppermint Lodge, for adults only. Kim the owner lovingly welcomed the girls in though for a vintage morning tea served in vintage on the shady verandah overlooking the mountain. Kalyra and Savannah helped Kim feed the chicken and collect the eggs, which were put into a small bucket (filled with leaves) to be taken to the kitchen for the next day’s breakfast. 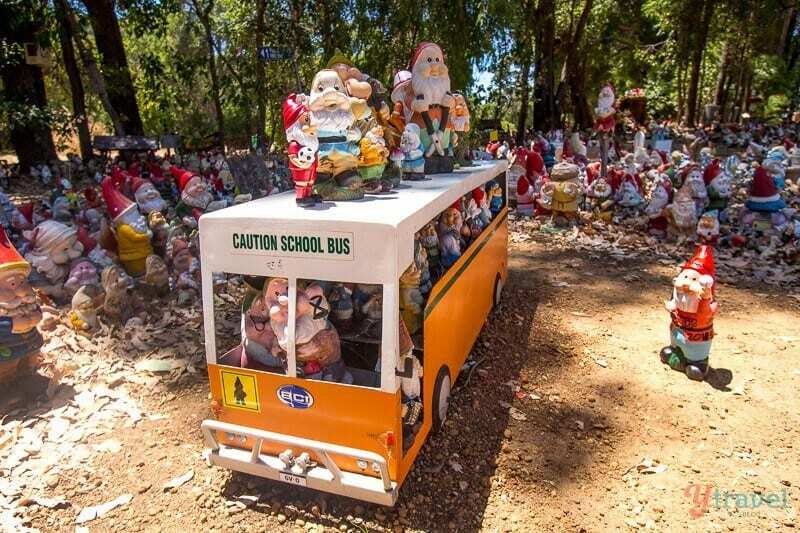 Australia doesn’t have many zany, quirky attractions or traditions. Gnomesville is one of them. The gnomes started appearing to silently protest the building of the roundabout. 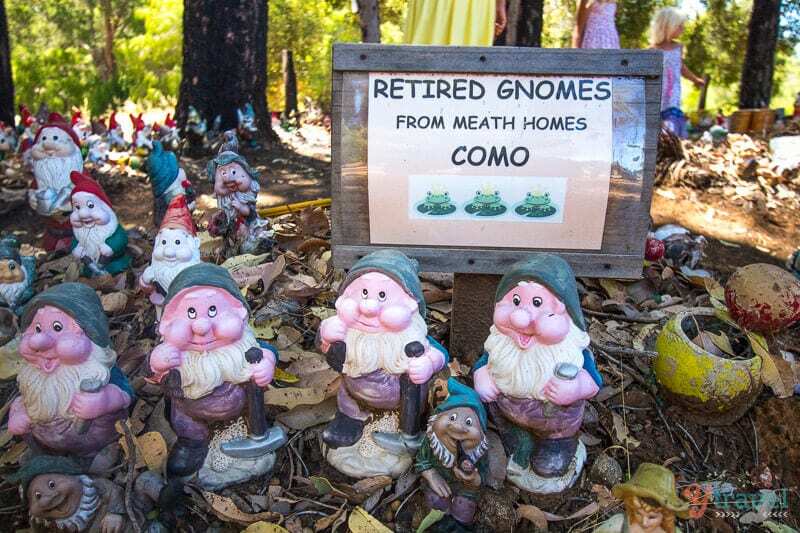 They were kicked off the roundabout and so a small gnome village was created for them just off the side of the road. 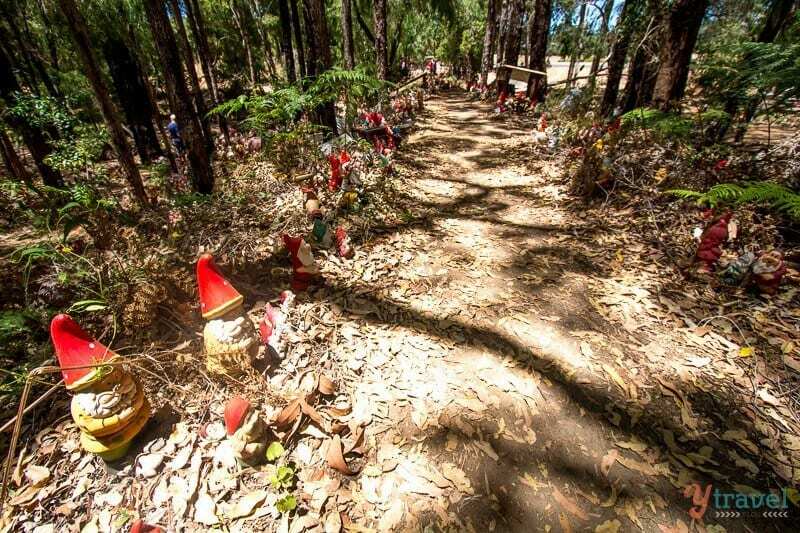 It now stretches some distance back into the forest and is covered with thousands of gnomes that have migrated from all over Australia and around the world. I’d had enough after 20 minutes, but could not drag the girls away from traipsing through the alleyways of Gnomesville and discovering gnomes like those trapped behind the fence of the detention centre (cracked me up!! ), flying planes, playing cricket, climbing logs and hiding in bushes. It is quite entertaining. Don’t forget to take your gnomes with you when you go and leave a bit of your gnome spirit behind. Gnomesville is located by the roundabout at the junction of Wellington Mill and Ferguson Roads, Wellington Mill, approximately 30 minutes drive from Bunbury. We stopped at Aidan Winery for a quick bite to eat – a tasty home-made soup and salad. The name derives from the district’s historic church that sits on its boundary. It has a pretty outlook and there is a large open space for the kids to turn around on. We didn’t taste the wines or stay for long, but we recommend it as a place to check out on your visit to the Ferguson Valley. The cellar door is open every day except Wednesday. By the end of the day, Jo and I (and Craig) were ready for wine tasting. 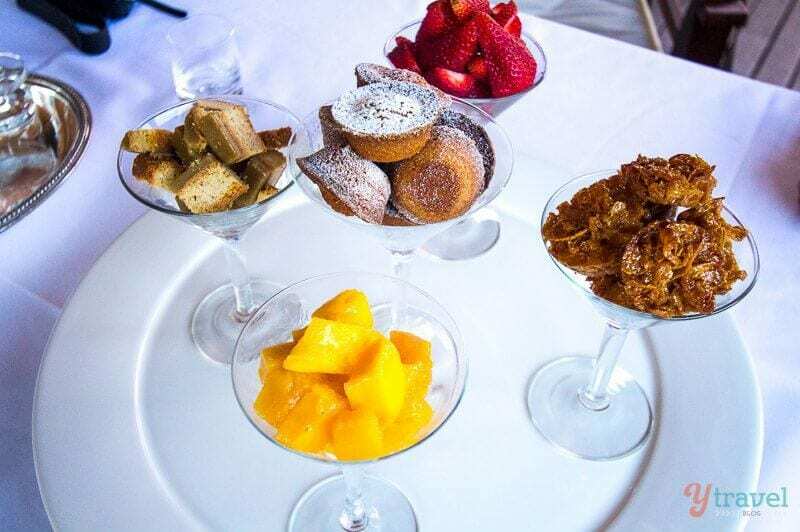 We sat down to a platter of cheese with owner, Peter Giumelli. 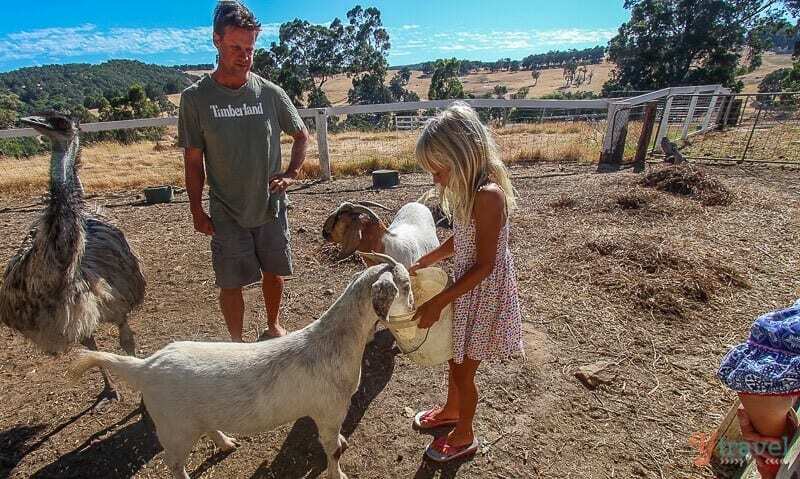 He told us lots of stories of the region, which highlighted a warm and welcoming community focused on keeping that home-grown flavour and sharing it with the outside community to come and enjoy on a visit. 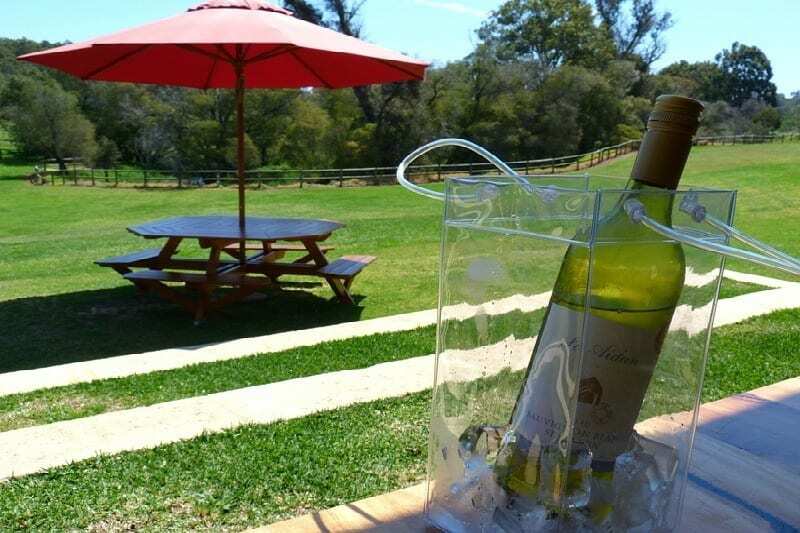 The outlook over the farm and vineyards offers a tranquil afternoon experience. 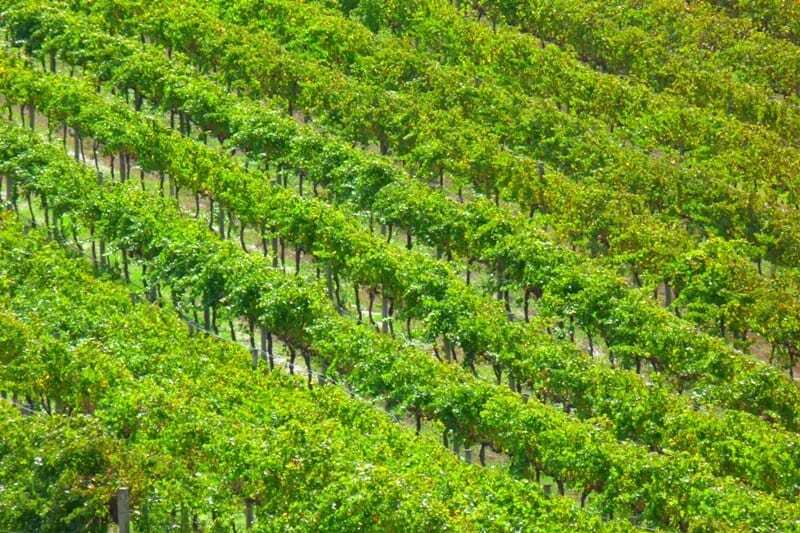 We left with a couple of bottles of wine – a delicious drop that tells stories. My favourite was the Chardonnay Verdelho 2010. 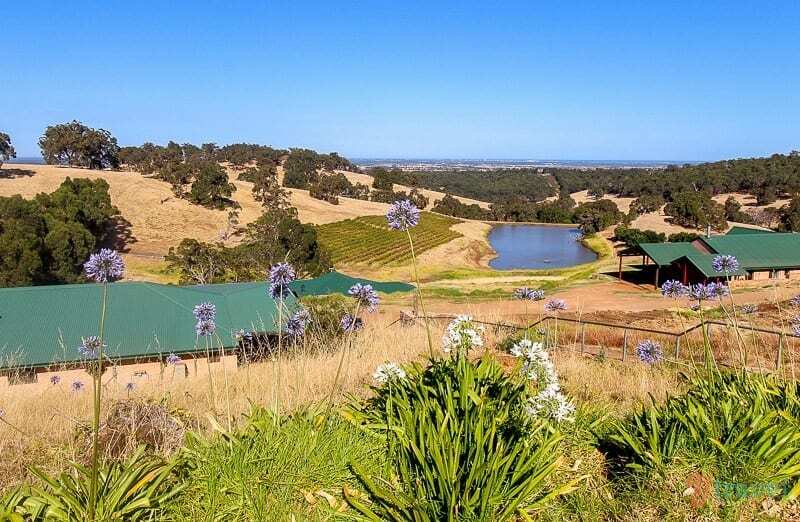 Ferguson Falls Winery is opened on Fri, Sat, Sun, & long weekends from 11.00am to 5.00pm – or call Peter and Margaret to arrange a suitable time for your visit. A cafe for lunch had just been opened when we visited. 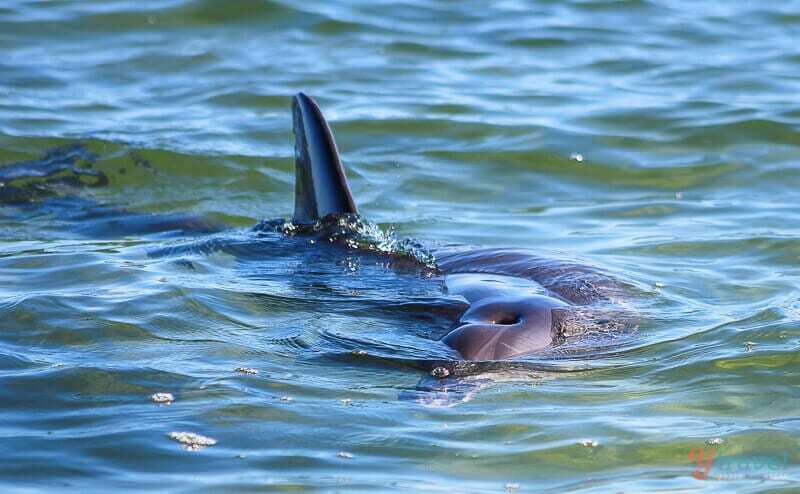 We wrote abut our experiences visiting with the wild dolphins at Monkey Mia here. It’s probably the most well-known place in Australia to have this experience. The only problem is, it’s a massive detour from anywhere to get there. We also found it too busy, and we were there in quiet season. 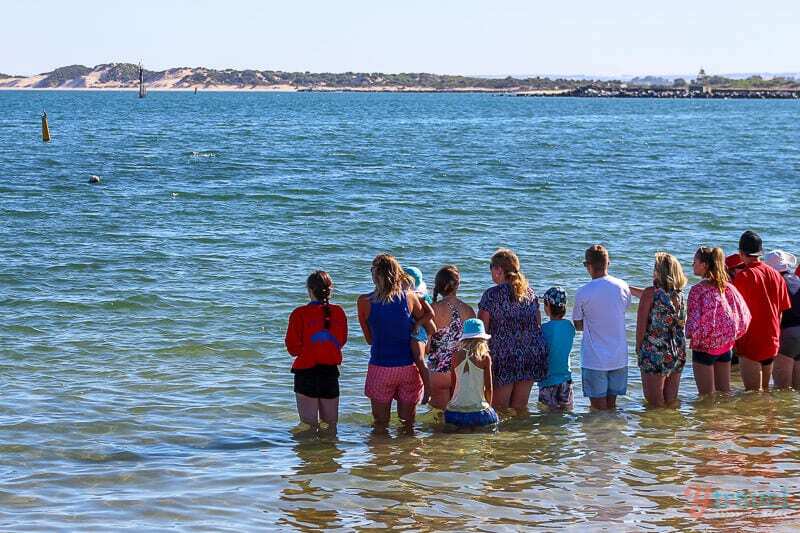 We enjoyed the wild dolphin experience at the Discovery Centre in Bunbury more. 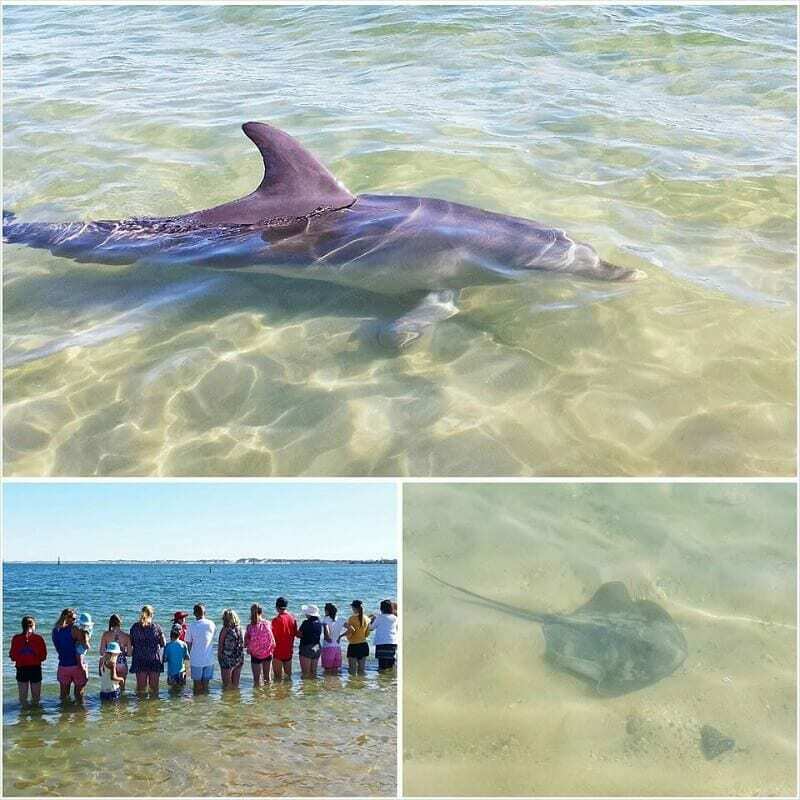 There were fewer people, it’s not far to drive from Perth, and we saw more dolphins. (but that’s purely a luck thing, so don’t base your decision on that, as the dolphins are wild). The Discovery Centre also has more options than just a wild dolphin experience. Inside the centre is a wide variety of interactive exhibitions and talks. The girls loved learning more about octopus here with the ranger. They giggled their heads off when the octopus poked his head out of his aquarium home and spurted water over everyone. What an incredible real life experience for them. Nearby there’s a quiet and lovely beach just down the road from the Mantra. There are watersports to enjoy, a cafe and a nice beach to sit on. The water is calm for swimming. 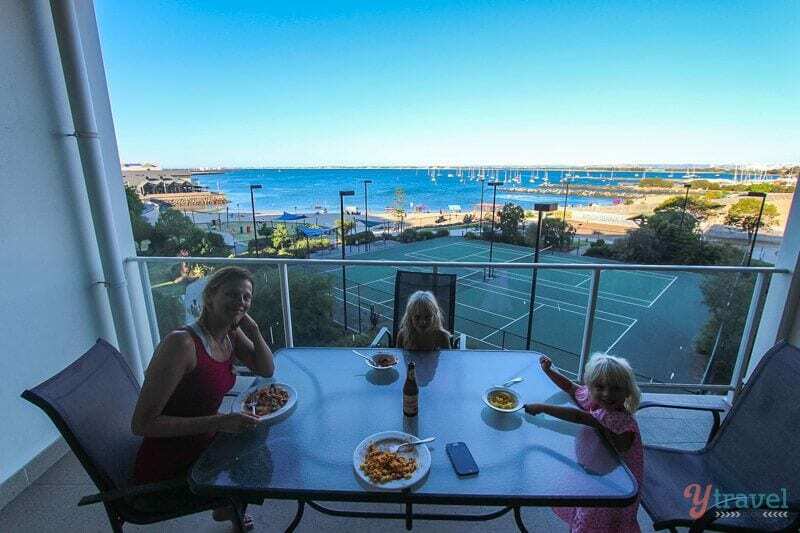 We partnered with Mantra on our 18 month trip around Australia and the Mantra in Bunbury made for a comfortable escape from our camper trailer for a few nights! 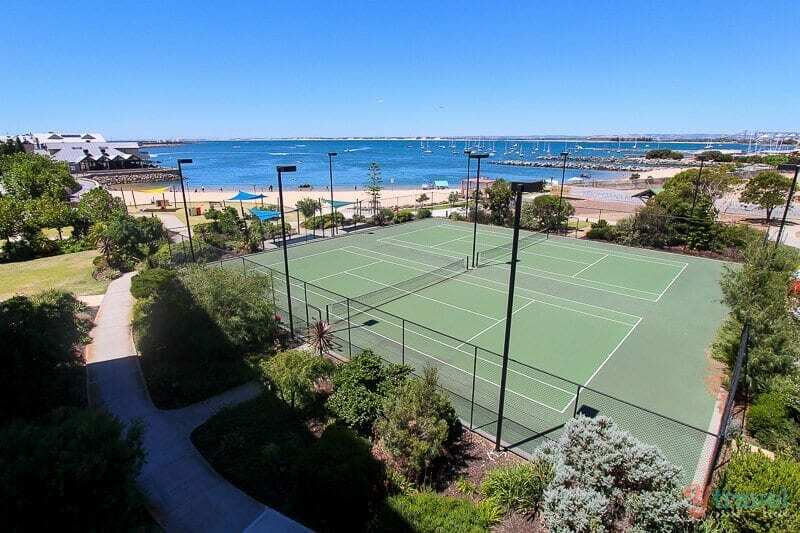 The apartments had beautiful views out over the water and we had a very enjoyable afternoon playing tennis together as a family. For the first time in my life (after many attempts) I actually beat Craig in a game!! Kalyra was most proud of how I carved him up! 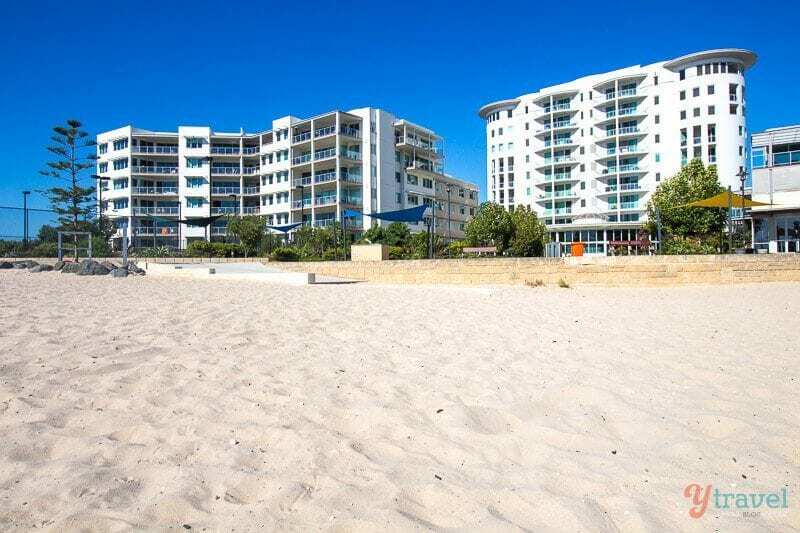 The Mantra is easy walking distance to town and the beach AND we could see the local Moo brewery from our balcony. We did not test it as we had just come off a joyous festive season and needed a break! Jennifer Harrison – Big Swamp (Bunbury) Wildlife Park with neighbouring Big Swamp playground, Wellington National Park, Moody Cow Brewery is great for lunch, you could visit Harvey (Stirling Cottages is great for a meal and linked to May Gibbs, Moo Shop and on the other side of Harvey at Harvey River Bridge Estate is the giant orange you can climb. In Bunbury have a look at the black basalt rocks opposite the Bunbury Runners Club especially at sunset, the Marlston Hill area has Lava Glass Gallery, Mash Brewery, Dome, Aristos, Taffy’s, Casellas and other little shops. 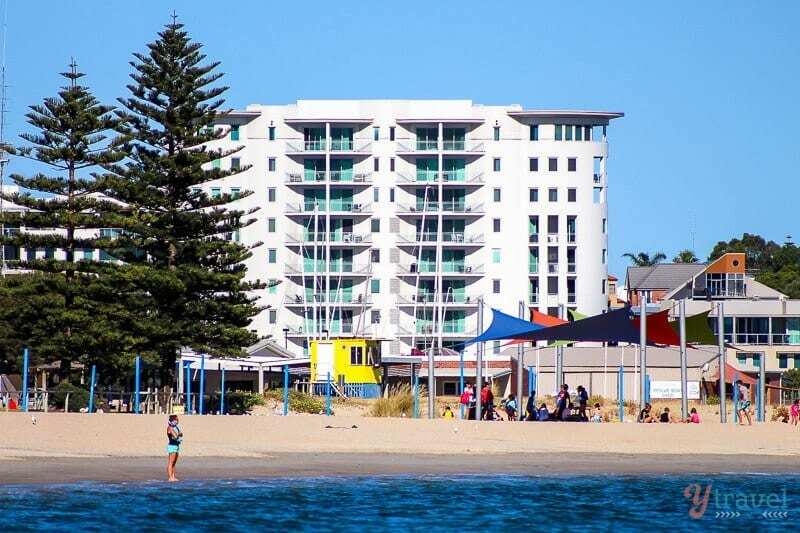 Eileen Wenn – take a short walk over Koombana bridge to the mangrove walk. It’s amazing. Aaron Donnelly – definitely try to pop into Wellington NP and swim at honeymoon pool and the girls can have a go trying to climb the big rock there, it’s a gorgeous view at the top. 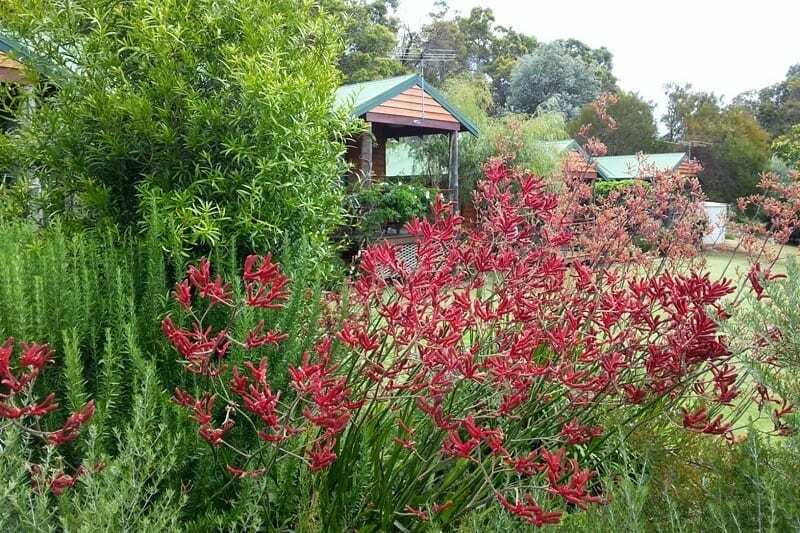 10 minutes from the NP is the little town of Collie where you can pop in for a bight of something to eat. Noelene Ball – take a drive out to Donnybrook to visit the biggest FREE adventure park for the kids. Lots of little cafes along the Main Street too. Fresh fruit and veggies from the Fruit Barn too. Out through the Ferguson Valley to visit Gnomesville is a must. Bonny Wells – scrumptious stone fruit in season in the donnybrook orchards, better than any you get in the shops. Mandy Denise – VAT 2 for a glass of wine whilst the kids play, and ice cream from ‘The Creamery’ on Victoria Street! 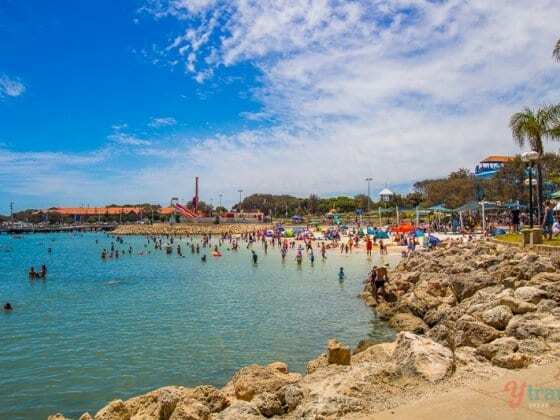 Koombana beach now has inflatables on the water and kayaks and SUPs for hire. Mash brewery is a lovely place to sit outside and watch the world go by. Kid friendly. 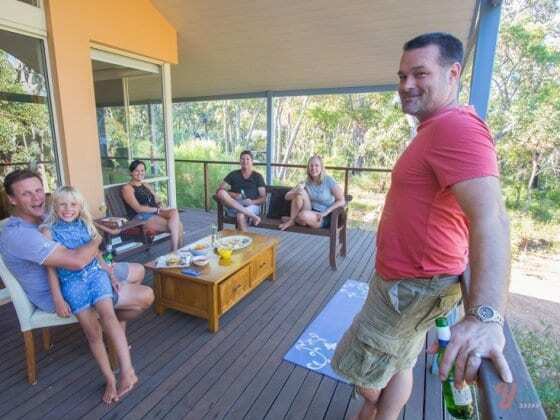 Booking.com has 924 properties in Western Australia including hotels, apartments, and hostels. You get free cancellation on most rooms and a best price guarantee. 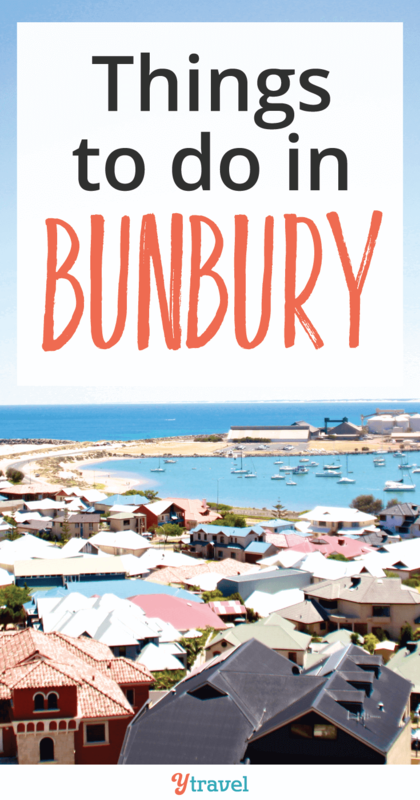 Have you been to Bunbury? Please share any of your own tips or suggestions. Or leave a question and we’ll hopefully be able to answer it. Wow, you nailed it! What a lovely post about the region. You’ve really captured the country feel of a regional setting which also incorporates beach life too. It was such fun being able to spend time with you and show you around my ‘hood’. So glad you enjoyed it – although it did come at a time when everyone was a bit exhausted after Christmas festivities 😉 Thanks for including some of my pics, I feel very honoured. Come back soon! On your next visit to the Ferguson Valley, I would love to see you at Lyndendale Gallery. Your children would love Rusty the rustisaurus and I am sure you would enjoy the wide range of quality art and crafts available. 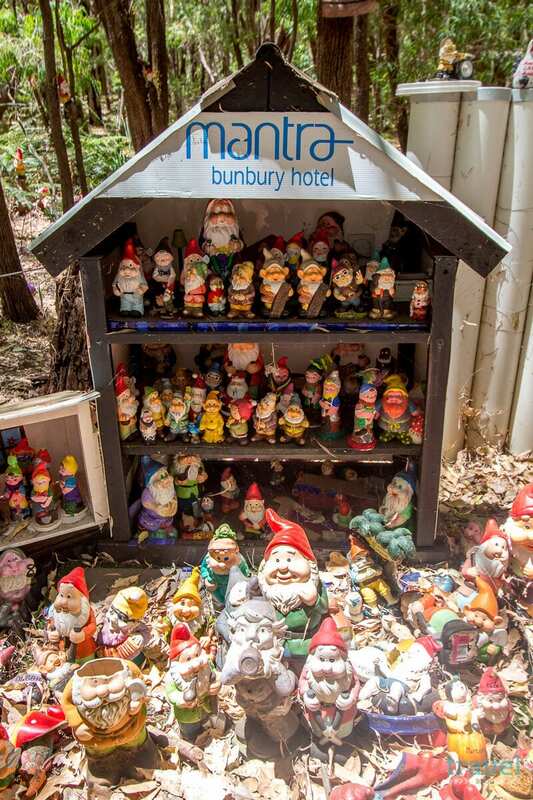 I went to Gnomesville on my tour of WA – one of the coolest, quirkiest places in Australia for sure! What a nice hotel you stayed. 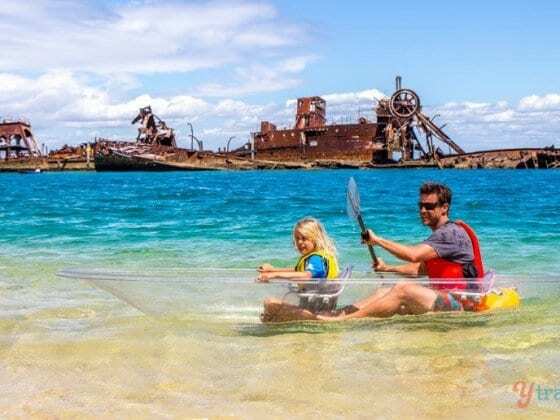 This surely makes your stay relaxing and fun filled with all the activities Bunbury could offer. I love the dolphin watching plus a visit to a winery. Everything looks great. 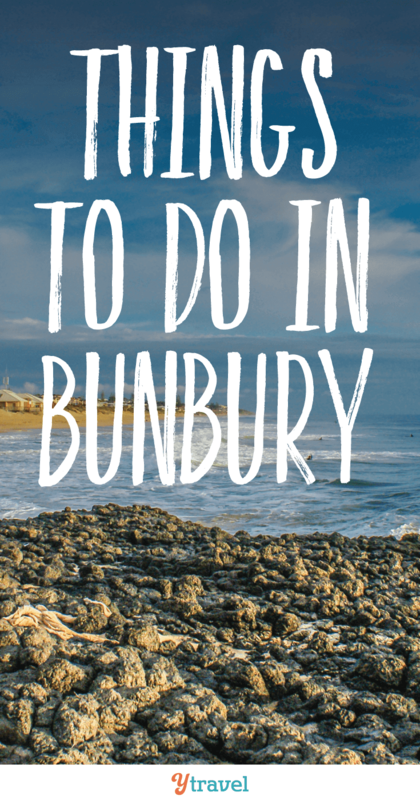 We recently visited Bunbury on our trip to Perth and loved it! Wish we had stayed longer. Sadly we didn’t see any dolphins at the Discovery Centre – you were very lucky to see some! Bunbury isn’t even 2 hours away from us, and we’ve only done one out of the 6! Gnomesville is truly a funny little place, isn’t it?! Hi Caz and Craig! Love this article! 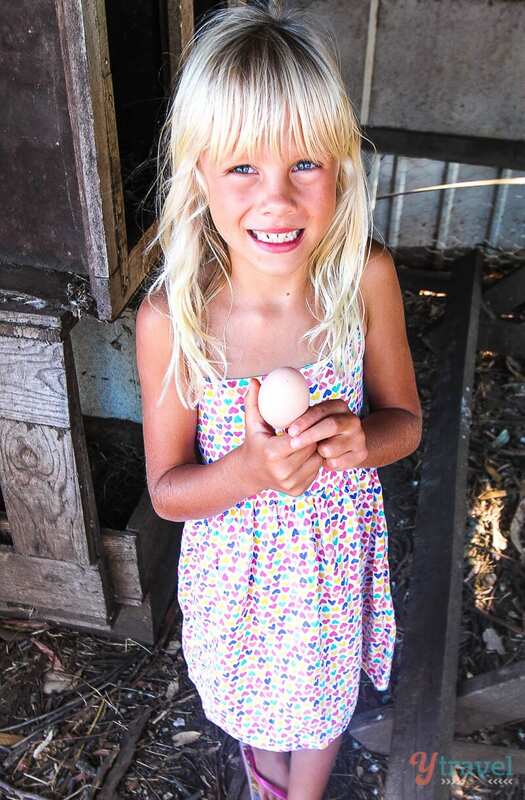 The pictures are really great and your daughter is super cute holding that egg. Thanks for sharing your experiences with your readers. Keep em coming.